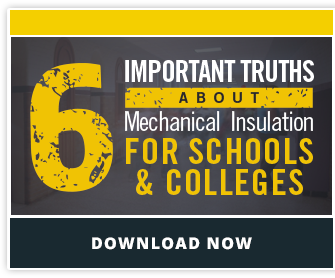 Luckily, a simple solution ensures your facility receives all of the cost-saving, energy-saving, and protection that mechanical insulation provides. Removable insulation covers and removable insulation jacketing are custom-made to fit your equipment’s exact specifications. The fact that your equipment is a weird shape is no longer an excuse not to insulate! With removable insulation covers, accessing equipment is as simple as undoing a strap. Few or no tools are required, and the cover can be quickly and easily re-installed by facility personnel once the work is complete. This thermal photo demonstrates exactly what removable insulation covers are capable of. The outside temperature of the removable cover is about 90 degrees F, while the valve is over 350 degrees F! This photo was taken at a manufacturing plant in St. Johnsbury, Vermont. Read more about the project here. North Country Mechanical Insulators manufactures custom removable insulation covers for areas where traditional insulation isn’t practical. One of the most effective ways to determine whether your facility has areas that can benefit from removable insulation covers is through an insulation energy appraisal. Energy appraisals calculate the energy and dollars a facility or process is losing with its current insulation system, so you can make informed decisions about how to update your insulation.